The name of the river seems to come from a traditional interpretation of the word, “flame,” when the Indian population fished at night, lighting their way by hand-held torches. Viet Van Dong and Jereme Rauckman met as freshmen at North High (Go Huskies! 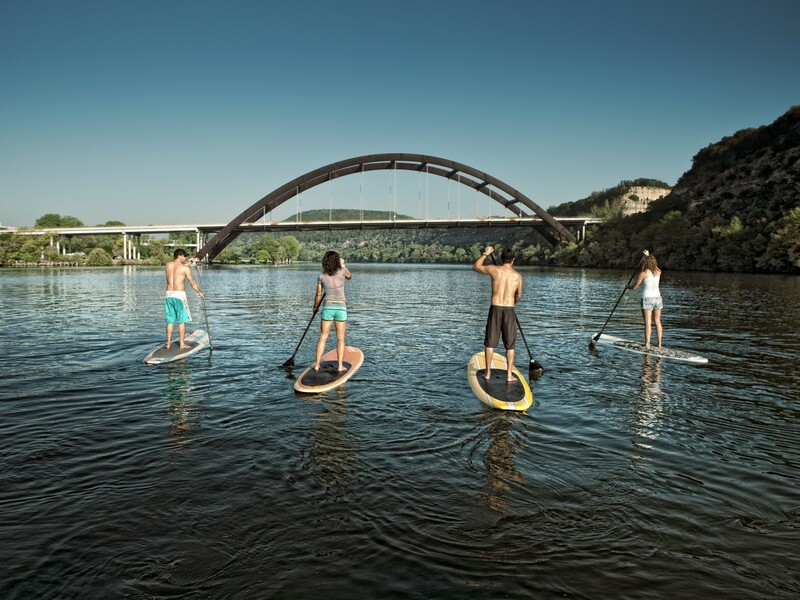 ), Eau Claire, Wisconsin, home of the 2015 United States Snowshoe Championships. They have been good friends ever since. 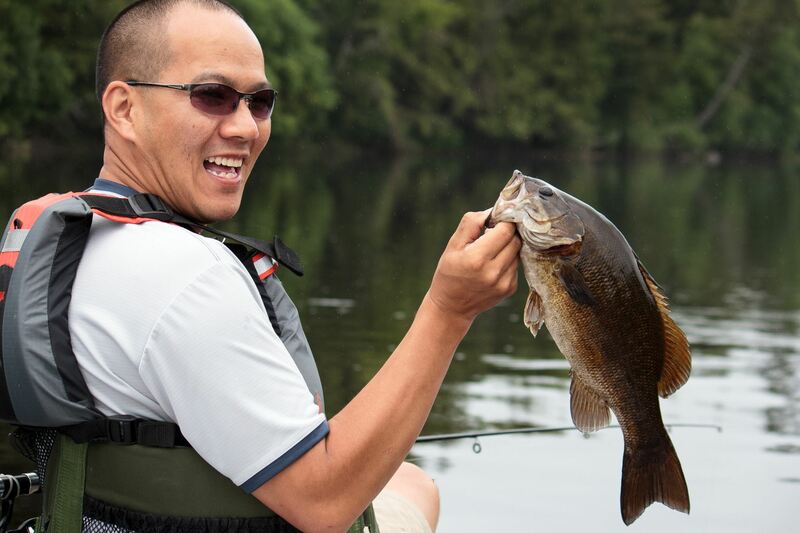 I can’t say there were very many surprises on the trip, as we had gotten some tips from others who had paddled that section, and I found good maps and river guides [see here]. I was surprised, though, by the campsites along the river. I thought they would be pretty bare-bones, but they had fire rings, picnic tables and pit toilets and were very well-maintained. Firewood was easy to come by (bring a hatchet to cut it to size, though). We were even visited by a friendly ranger one evening, [Curtiss Lindner, Asst Property Mgr, Flambeau River State Forest] who gave us some info on upcoming rapids and fishing tips. I was also surprised by the few people we saw. I had heard that this was a popular paddling route, but we really saw very few people, aside from a larger group we bumped into a few times. Most of the rapids on the river were pretty exciting yet doable for beginners, though we had an aluminum canoe that tended to get hung up (paddlers with plastic or Royalex were sliding through fine). 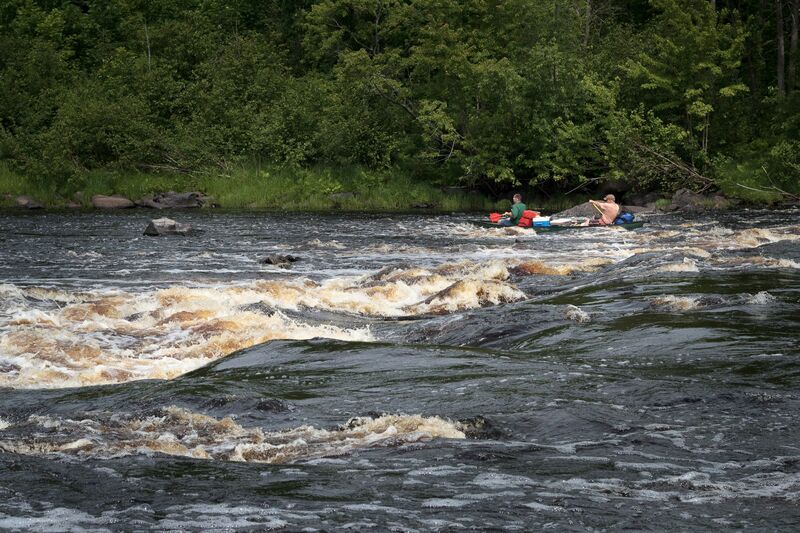 The two larger rapids had portage trails for those who didn’t feel ready to run them. Wildlife sightings were plentiful. A bear crossed the road in front of us on the shuttle ride up. 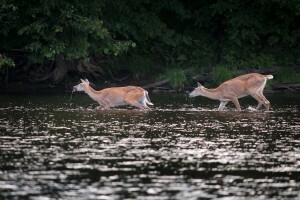 There were a lot of deer in and along the river each day. 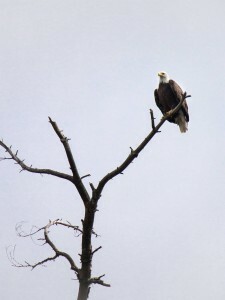 Several bald eagles entertained us. 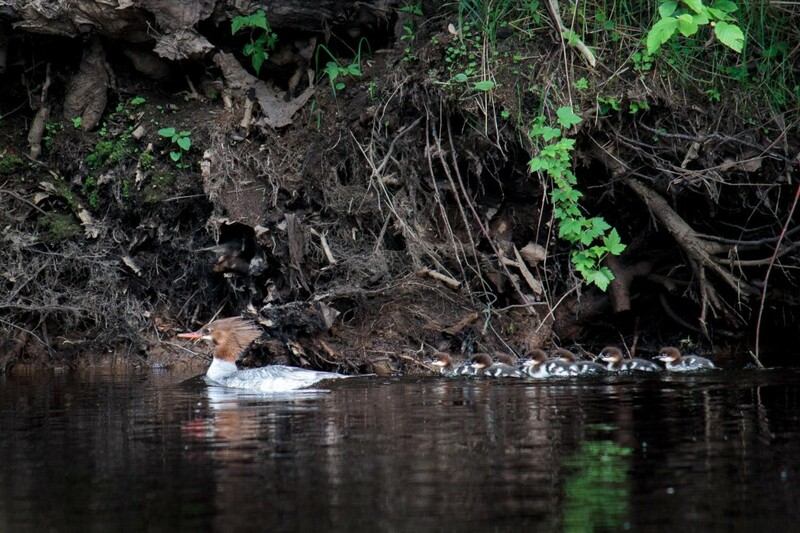 We eyed Mergansers, which I had never seen before and had to look up in my bird book once I got home. We heard coyotes at night and awoke one morning by wild turkey in our camp. There were also a lot of white admiral butterflies, which in some spots appeared by the dozens. As for the bugs, we were mosquito-free while on the water, but they showed up in clouds on shore. 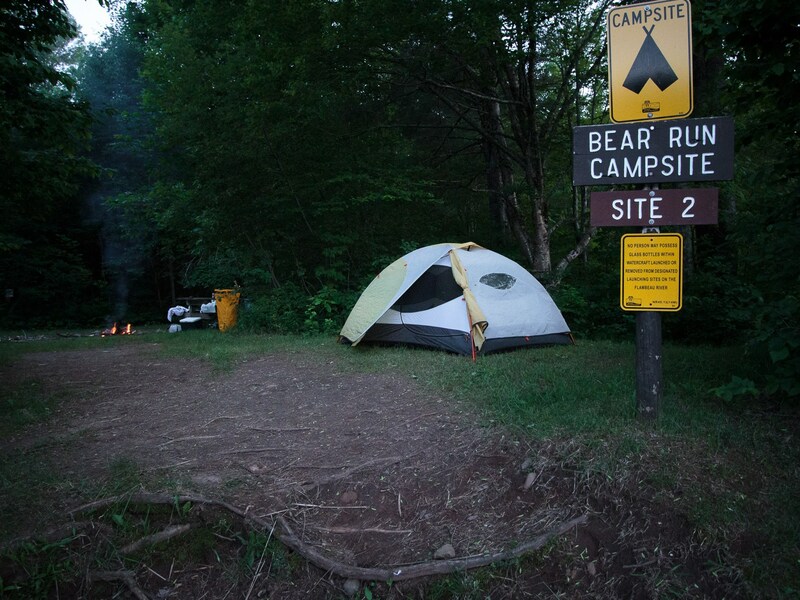 Fortunately, bug spray and a Thermacell at camp did a great job of turning them away. There were flies around the boat as we paddled, but there weren’t many, and they were happy to circle the boat and not come in for the attack often at all. We ended the trip back at the Flambeau Lodge where we had left our vehicle. [Some advice on the trip:] The last few miles of river were wider, more developed and slow. One could start their trip further north and pull out at Beaver Dam Landing if they wanted to put in the same distance but avoid that last section. 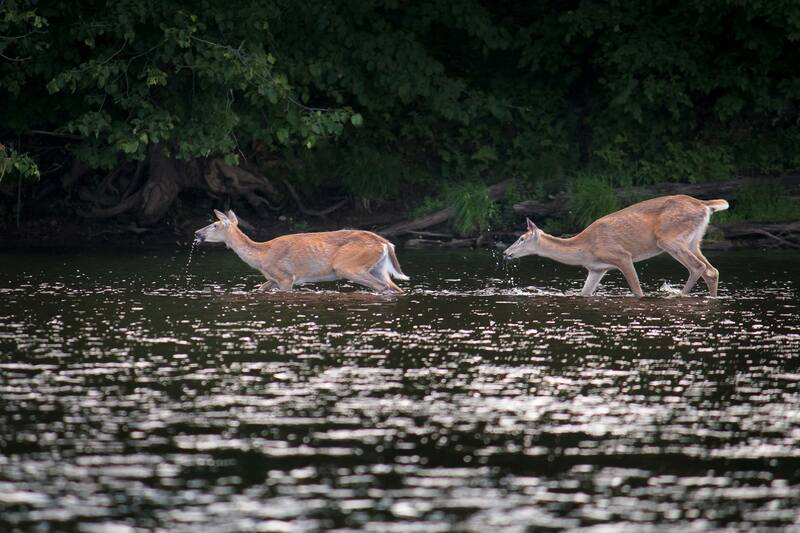 “Two whitetails play in the river as we drift by.”There were flies around the boat as we paddled, but there weren’t many, and they were happy to circle the boat and not come in for the attack often at all. We ended the trip back at the Flambeau Lodge where we had left our vehicle. [Some advice on the trip:]The last few miles of river were wider, more developed and slow. One could start their trip further north and pull out at Beaver Dam Landing if they wanted to put in the same distance but avoid that last section. The article’s title, you ask? As I saw it, the journey for these two new arrivals (“nouveau”) led to new views and scenes for them (“tableau”) on the famous, flowing Flambeau; the result are memories and videos in the mind that last forever. That is why one expands their horizons, one paddle or step at a time. It is a gift no one can take from the adventurer. Readers are encouraged to visit the links provided; they were selected for the information that is not only thorough, but also the things one can learn from these sites remain truly remarkable. 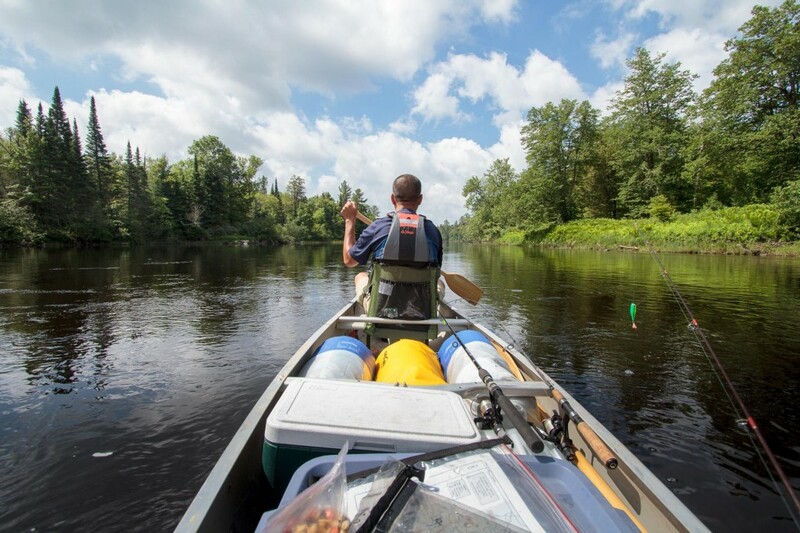 This entry was posted in Canoeing, Destinations, Features, Homepage Featured and tagged Beaver Dam Landing, Canoe, deer, eagles, Eau Claire, Flambeau, LadySmith, Merganger, Oxbo, Park Falls, river, Royalex, Thermacell, Tuscobia, Wisconsin by Phillip Gary Smith. Bookmark the permalink.